You stumble out of bed, drag a comb across your head, pour a large amount of coffee down your throat, and call Flight Service for a WX briefing. It looks clear and a million along your entire route, and today's flight is a GO. But instead of driving all the way to the airport, you slip out the kitchen door and into your...hangar. In the spot where most people keep their Chevy is your aircraft, fueled and ready for you to depart from your airpark home. This is about as good as flying gets. For the few (and very lucky) pilots who get to live in one of the residential airparks scattered around the country, “living with your plane” makes it easy to pre-flight and depart almost from your living room. That location of your hangar – right there next to the kitchen – also makes those late night arrivals a non-issue as you taxi right up your driveway, put the plane to bed next to the lawn mower, and slip quickly into the sack only minutes after wheels down. In my research for this photo shoot, I found out that there are hundreds of fine residential airparks in the country, but very few with runways long enough to safely land a Gulfstream, Falcon or high-end Cessna Citation. There are even fewer that would allow those types of airframes to take back off again in high/hot conditions. 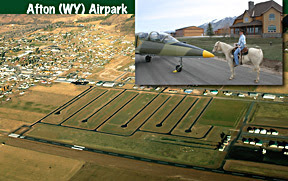 This may be precisely the reason why the developers of Afton Airpark are reporting brisk sales. But the real reason people are buying up these home sites in Afton is the location. It's Wyoming, need I say more? And yes, part of Miller's payload was a golf bag. As we loaded and he unloaded, he just nodded a friendly howdy, much the way everyone in the Star Valley will greet you. I respected his privacy and let him have his peace and quiet, but honestly, I would have loved to take a peek into that Calloway bag. While this is not meant to be a sales pitch, it IS my blog, so here goes: If you know anyone with the means to build a nice second home and who also owns just about any aircraft – but especially a business jet – then do them a favor and aim them at Afton Airpark. The area where the airpark is located is ripe to explode with new construction and excitement, anchored by a new 18-hole signature Johnny Miller (same guy) golf course across the street from the airport. For a second home, this place just rocks, and presents a very good value considering the soon-to-be upmarket location. But for the investor who wants to sit on some dirt and watch the market move, there are quite a few like minds who have scooped up lots and are waiting for the Star Valley real estate market to move in the same upwards direction as Jackson Hole. 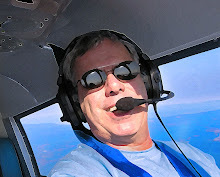 Bottom Line: I shared Easter dinner with a couple of the main financial interests behind this Airpark, and can say without reservation that these are some very cool pilots, married to simply wonderful aviation-friendly wives. One principal flies an L-39 jet just for fun (yes, it lives in his hangar next to his beautiful home at the airpark), and the other is a retired American Airlines Captain with nearly 500 Atlantic crossings in his logbook. If these are the quality of people who would be your neighbors as you live with your plane up in Afton, I can see no way that the situation could be anything less then awesome.